The American Civil War, updated week by historical week, by James Bissland, author of "Blood, Tears,and Glory: How Ohioans Won the Civil War," published in October 2007. 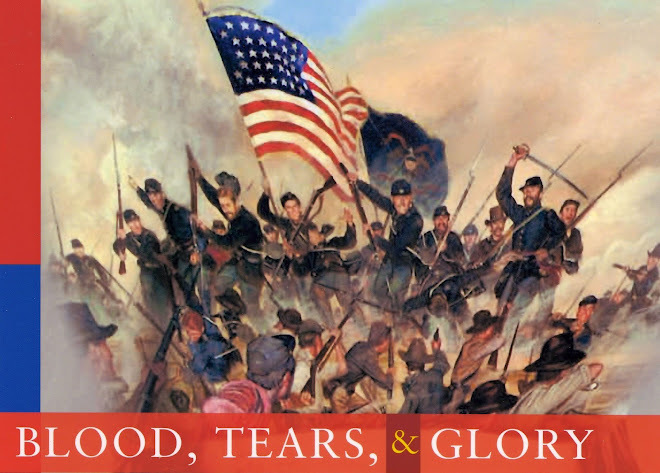 AUTHOR’S NOTE: Effective April 25, “Blood, Tears, and Glory—The American Civil War, Day by Historical Day," changes to a weekly format, presenting a summary of that week’s events in the war. While the emphasis will continue to be on the Western Theater, all major events in the war will be recognized. With warming weather, troops on both sides come alive, with skirmishes breaking out like brushfires across the nation. The Confederacy has seen little but failure since the beginning of the year, and it looks as if the worst is yet to come. McClellan has a huge force on the Virginia Peninsula, his objective the Confederate capital of Richmond. Another huge force, under Halleck, is hunkered down in southwestern Tennessee with the crucial Confederate rail center of Corinth, Mississippi, as its objective. Smaller forces are moving in the Shenandoah Valley of Virginia, where the Federals have pretty much had their own way. And in the Mississippi estuary a fleet of Union warships is about to start moving against the Confederacy’s busiest port: New Orleans. 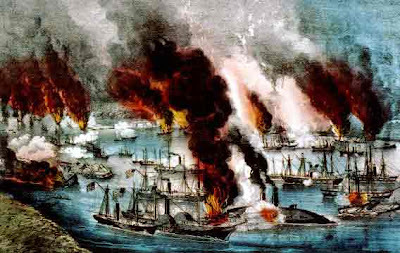 On Sunday, April 20, a daring party of Federals uses explosives to weaken the Confederate barricade of chains and old hulks that block the Mississippi River and access to New Orleans. On Monday, the Confederate Congress agrees on exemptions to the sweeping conscription bill it passed last week requiring three years’ military service from all white males ages 18 to35. On Wednesday, April 23, Capt. David G. Farragut ponders the failure of his 19 mortar boats to destroy two Confederate masonry forts (Forts Jackson and St. Philip) guarding the passage upriver to New Orleans. The mortars had rained hundreds of shells on the forts, to no avail. Swamps in the area prevent a land attack on the city as well. Farragut decides on a daring dash of his wooden warships between the defiant forts, which are on opposite shores of the Mississippi. Next, Farragut’s warships encounter a small Confederate defense fleet, including the ram CSS Manassas. The ram and other vessels, though fighting bravely, fail to stop Farragut and the Rebel fleet is demolished, while the Union navy loses only one vessel. The Confederates lose eight. Farragut keeps moving and on Friday anchors outside the city of New Orleans. Braving jeers and threats from city residents, a party of Union naval officers comes ashore to begin surrender talks with the city’s mayor and the commander of Confederate forces in the area. The city’s mayor claims not to have the authority to surrender the city. Confederate Maj. Gen. Mansfield Lovell, commander of Confederate forces, chooses to withdraw rather than surrender. The way is clear for Union troops, under Maj. Gen. Benjamin F. Butler, to march into the city unopposed. New Orleans was the Confederacy’s second largest city and its busiest port, the gateway to the Mississippi and the nation’s heartland. Its loss is a tremendous psychological blow to the Confederacy. It makes Farragut a Union hero, and is one of the most decisive victories of the war. Also at Pittsburg Landing, Maj. Gen. Henry W. Halleck is getting ready to launch an attack—the first important military action “Old Brains” has ever led in person. His target is the Confederate base at Corinth, Mississippi, 22 miles southwest of the Union encampment. To reinforce Halleck—a man who hates to take chances— Brig. Gen. John Pope’s Army of the Mississippi has arrived to join Brig. Gen. Don Carlos Buell’s Army of the Ohio and Maj. Gen. Ulysses S. Grant’s Army of the Tennessee. Halleck spends the week issuing orders to shape up the volunteer forces, which he considers undisciplined. On Saturday, April 26, Union Brig Gen. John G. Parke accepts the surrender of a small body of Confederates holding Fort Macon, a pentagon-shaped structure of brick and stone built on one of the barrier islands along coastal North Carolina. The old fort, a Federal facility built before the war but seized by Rebels in 1861, has been under Union artillery fire from gunboats and land batteries for nearly a month. It’s all part of Maj. Gen. Ambrose Burnside’s invasion of eastern North Carolina. In the Shenandoah Valley of Virginia, Union Generals Nathaniel P. Banks and John C. Frémont have 15,000 troops each with which to deal with Stonewall Jackson’s 14,000 men. As the month ends, the Federals are threatening Staunton, held by the Confederates. So far, here in the Valley the tide has been running in the Union’s favor. On the Virginia Peninsula, Maj. George B. McClellan’s Army of the Potomac has halted in front of Yorktown and McClellan is preparing a siege. Things do not look good for the Confederacy, and President Jefferson Davis is taking increasing criticism for his conduct of the war. But a little known commander named Robert E. Lee is serving as military adviser to Davis and soon will emerge into prominence. IT’S COMING SOONER THAN YOU THINK: April 12, 2011—scarcely 3 years from now!—will be the 150th anniversary of the outbreak of the Civil War. In 1861, April 12 was the day Confederates opened fire on Fort Sumter in Charleston Harbor. A significant number—though a minority of Grant’s troops—had panicked and run away, taking shelter under a bluff at Pittsburg Landing. Of the 41,500 men present for duty at Shiloh on the first morning, estimates of those who fled range from 4,000 to 5,000 (In Grant’s opinion) to 15,000 (Buell’s). Reactions to the first experience of combat varied. Although some men on both sides fled the field, the majority of soldiers remained in the fight, despite their fears. And then there were those who were energized by fighting, who came alive in the eyes of their peers and forgot whatever apprehensions they may have had. As the war went on, the men around Ulysses S. Grant would discover he was one of these. Sherman seemed to be another. At Shiloh, Sherman remained in the thick of the fighting at risk of his life, galloping back and forth to rally his men. Grant said he found it unnecessary to stay long with Sherman during the battle, explaining, “Although his troops were…under fire for the first time, their commander, by his constant presence with them, inspired a confidence in officers and men that enabled them to render service on that bloody battlefield worthy of the best of veterans.” This was the same man who had seemed so spooked by the mere possibility of Confederates bearing down on him in Kentucky. Underlining certain words for emphasis, Opdycke told Lucy that “I was conscious of the danger all the time, but felt that as an officer, I was there to perform certain duties, so that in my mind, all the danger sank into comparative insignificance. Civil War armies spend more time wrestling with bureaucracy and struggling with paperwork than they spend in battle. The innocent victims of all this are the army’s own soldiers, and especially their families. Few soldiers were wealthy enough to leave their families well provided for. Even top commanders like Grant and Sherman have to regularly fuss with arrangements to send money home. Families of the ordinary farmers, craftsmen, and shop workers who make up the army’s rank and file are never far from destitution even in the best of times. It imposes an almost unbearable hardship when soldiers cannot regularly send home their meager pay ($13 a month for ordinary privates). Failure to pay soldiers on time is a common occurrence. The cause is an old-fashioned bureaucratic system that breaks down under the strain of war. Today, Maj. Gen. Ulysses S. Grant attempts a strategy to relieve the problem for the 58th Illinois Volunteer Infantry. Most members of the regiment, except for 150 men and one or two company-grade officers, were captured in the recent battle at Pittsburg Landing (“Shiloh”). The remnants of the 58th Illinois have been left without the paperwork (“descriptive rolls” and “discharge papers”) needed to authorize soldiers’ pay. All the regimental officers, who could furnish such paperwork, have been taken prisoner. At the request of one of his division commanders, therefore, Grant approves consolidating the remnants of the 58th Illinois with the 18th Illinois as a way of achieving the regimental structure needed to deal with the problem. ELSEWHERE IN THE CIVIL WAR: Last week, the Confederate Congress approved (and President Jefferson Davis signed) a bill ordering into military service all white males ages 18 to 35. Today, the Congress approved badly needed exemptions to the overly broad conscription act. Among those who will not be drafted are government officials (of course! ), telegraph operators, educators, druggists, hospital workers, and workers in certain essential industries. Having tidied up the conscription act, Congress adjourns. The Confederate military situation worries President Jefferson Davis, although no major military action occurs today. Nevertheless, Union generals McClellan and McDowell are leading armies in the direction of Richmond, Union naval mortars are pounding the defenses of New Orleans, and Burnside has established himself in eastern North Carolina. Things do not look good for the Confederacy. President Lincoln informs General McClellan, now on the Virginia Peninsula, that Fredericksburg, Virginia, has been evacuated by the enemy and General McDowell is positioning himself near the riverbank across from the town. While tens of thousands of Union soldiers at Pittsburg Landing, Tennessee, glumly adapt to the heavy hand of their new commander, Maj. Gen. Henry W. Halleck, a few thousand others are cheerfully making the best of things in the mountains of western Virginia. They are the men of Scammon’s brigade (the 12th, 23rd, 30th Ohio Infantry, plus the 1st Ohio Independent Battery) in the Union’s Mountain Department (western Virginia). They have a spent a long, dreary winter doing not much in the snowbound valleys of what is now West Virginia. With the promise of spring, however, they are on the move at last, tramping eastward, then southerly, bound—the men hope—for glory where a real war was going on. A cold, pounding rain halts the march, however, and tents must be erected. Nonetheless, the men are so happy about the promise of action that they sing and laugh, according to Lt. Col. Rutherford Hayes, who is effectively the commander of the 23rd. The men “keep mirthful,” he says. One of the regiment’s surgeons plays poker and loses a knife and 50 cents. Hayes wanders around, listening to storytelling and cracking jokes. While writing Lucy, Hayes is alone is his tent, using a book as writing desk. He is surrounded by belongings: saddle, rubber ground cloth, an old hat, haversack, saddlebags. Behind him is his cot heaped with his clothing; in the center of the tent is a sheet-iron stove, unlit. The rain rattles against the tent wall, a damp cold settles on everyone, and only the promise of eventual sunshine and warfare lightens the mood. Having taken personal charge of the troops gathering at Pittsburg Landing, Maj. Gen. Henry W. Halleck, commander of the Union’s Department of the West, has his hands full whipping thousands of free-spirited volunteers into shape. He is trying to impose Old Army rules on New Army men. No doubt the volunteer armies, composed mostly of citizen-soldiers just off the farm, can benefit. But these are soldiers willing to fight for their country, under leaders they respect for their courage and concern for their own men. They will only reluctantly follow martinets who live by the rulebook. Halleck is demanding too much at once. ELSEWHERE IN THE CIVIL WAR: As if Confederate authorities didn’t already have enough to worry about, Federal soldiers are gathering on Ships Island, not far from New Orleans. Flag Officer David F. Farragut has organized a large fleet of Union warships nearby as well. David Dixon Porter is present with a fleet of mortar boats, and Gen. Benjamin Butler has transports loaded with troops. To defend the Crescent City, the Confederates have two forts manned by a small number of militiamen, an improvised barricade of chain and hulks, and a small river fleet. New Orleans is the gateway to the Mississippi and of great importance commercially and militarily. Maj. Gen. Henry W. Halleck—“Old Brains”—arrived at Pittsburg Landing (“Shiloh”) last Friday to take personal command of all forces there. Yesterday, Maj. Gen. Ulysses S. Grant wrote Julia that although Halleck is “in command of the whole, Buell & myself [are] commanding our separate armies” (the Army of the Tennessee and the Army of the Ohio, respectively). Wrong. In fact, Halleck and President Lincoln are working out a plan to punish Grant for his lack of preparedness at Shiloh by relegating him to a meaningless, powerless position as Halleck’s “second-in-command.” For how long is unknown. When Halleck begins his ponderous advance on Corinth, Mississippi, within a few days, Grant will discover Halleck’s orders to Grant’s army are bypassing him, leaving him with little to do. Until the Federal force begins its advance, however, Halleck keeps busy trying to shape up the troops at Pittsburg Landing. He writes his wife that “this army is undisciplined and very much disorganized, the officers being incapable of maintaining order.” Halleck (who has never commanded anything larger than a platoon before) is bringing a regular army mentality to the reality of volunteer soldiers, who require a different kind of leadership. In a clumsy attempt to win their respect, he occupies an ordinary soldier’s tent instead of something more comfortable. Then a barrage of directives flow out from the tent, ordering more drilling and less carousing. In a few days, however, this army will begin moving once again and the soldiers will experience a new kind of frustration under Halleck’s leadership. Although Brig. Gen. William Tecumseh Sherman’s right hand is “temporarily disabled” by inflammation caused by a buckshot wound during the battle of Shiloh, he is anxious to spread the word about how he has redeemed himself. Despite his sore hand, he manages to get off a short letter his brother, Sen. John Sherman, in Washington. After weeks of suffering shame for his emotional collapse under pressure in Kentucky, Cump wants his brother to know how well he performed during the battle of Shiloh. He includes a copy made of the laudatory letter, recommending promotion, that Maj. Gen. Henry Halleck wrote about him, saying he “contributed largely to the glorious victory of the 7th”. ELSEWHERE IN THE CIVIL WAR: President Lincoln signs an act releasing all slaves in the District of Columbia, in return for compensation to owners of sums not to exceed $300. In McClellan’s Peninsula Campaign is stalled in front of Yorktown, Virginia, as the cautious commander of the Army of the Potomac awaits reinforcements and siege guns. In northern Alabama, Ormsby Mitchel’s division of Buell’s Army of the Ohio captures Tuscumbia, after taking Decatur yesterday and Huntsville last Friday. In Richmond, a worried President Jefferson Davis approves the drafting every white male between 18 and 35 for 3 years’ service. No exceptions were designated, although a number will be approved in a few days. 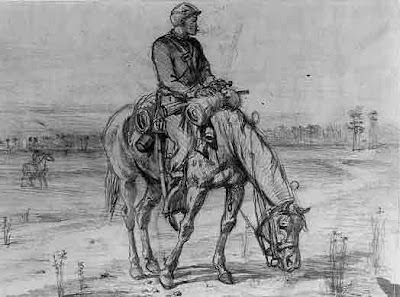 It took a while for the cavalry to win an important role in the Civil War. During the war's buoyant first weeks, the six regiments of cavalry in the Regulars were thought to be enough. That ended with the shock of first battle of Bull Run, and, with authorization from the War Department, Ohio began raising its first regiment of horse soldiers in July 1861. But it was not until 1863 that cavalrymen were seen as being more than scouts, sentinels, orderlies, and messengers. Ohio’s first call for cavalry volunteers was met with so much enthusiasm that 1st Ohio Volunteer Cavalry’s officers could be highly selective in recruiting. They had their pick from the “yeomanry of Ohio.” Most recruits were farmers and their sons--strong, healthy men. The "yeomanry" not only knew their horses, but in some cases brought their own mounts with them (for which the government paid them 40 cents a day.). The 1st Ohio Volunteer Cavalry was organized at Camp Chase in Columbus. Diverse in its origins, the regiment drew members from 18 of Ohio’s 88 counties, most of which are in the southwestern part of the state. As hundreds of spectators watched, the regiment trained during beautiful fall weather of 1861. First, the men were trained in dismounted drill, twice a day, with no horses in sight. Only after the men were proficient in fighting on the ground were their horses issued and mounted drill begun. Each trooper was equipped with a saber, revolver, and carbine, and carried in addition a rubber ground cover, an overcoat, shirt, extra underwear and socks, feed sack, lariat, curry-comb and brush. The men of the 1st Ohio were also furnished, by the United States Sanitary Commissions, with large cotton comforters, cumbersome and hard to pack. It took soldiers to lift a saddle, accompanied by a navy blue blanket blanket, onto the horse. Fully loaded with trooper and equipment, the cavalry horse groaned under a load weighing 255 to 270 pounds. Mustered in October 5, the regiment of a thousand men left camp early in December, trotting through the streets of Columbus, the men singing "The Girl I Left Behind Me." Thousands of spectators, including families and sweethearts waving flags and handkerchiefs, cheered as the regiment headed for the stockyards and an awaiting train. After passing through Cincinnati, where they boarded steamboats that would carry them down the Ohio River, the men and their horses joined Don Carlos Buell’s Army of the Ohio in Louisville Kentucky. The 1st Ohio Cavalry did not arrive at Pittsburg Landing (Shiloh) until shortly after the battle. They found a desolate and muddy field of shattered trees, wrecked artillery pieces, abandoned rifles and knapsacks. Many dead and wounded soldiers were still lying on the ground on April 9. The 1st Ohio settled down for nearly two weeks of miserable camping on the battlefield. Their tents had notyet arrived and it rained every day, so the troopers' blankets and clothing were never dry. Crude, temporary shelters had to be fashioned from saplings, saddles, and blankets. While Halleck’s growing army waited for the order to advance on Beauregard’s Confederates 22 miles away at Corinth, Mississippi, the cavalrymen served as sentinels. They sat, mounted for tedious hours on their horses, and stationed out in front of the infantry camps. They were going nowhere, so they were bored, but they were also nervous. Other cavalrymen remained in reserve, trying to rest. ( A typical sentinel is pictured above.) However, there were nights when there was a great deal of firing on the picket line—often caused by wild animals, disoriented Union soldiers, or Confederate deserters It was not unusual for the reserves to be awakened half a dozen to a dozen times a night—often by a false alarm, occasionally for a skirmish with the enemy. Unlike the Confederates, early in the war Union cavalry units were scattered among infantry units instead of being concentrated as a strategic combat arm. Later in the war, better organization and leadership will bring the Union cavalry out of the shadows. Until then, the “boots and saddles” bugle call will sound a little hollow to the cavalrymen from Ohio. Brig. Gen. William Tecumseh Sherman writes Ellen today from his camp on the Shiloh battleground. He recounts yesterday’s expedition up the Tennessee River that successfully destroyed an important railroad bridge, but his biggest news is about a message Maj. Gen. Henry W. Halleck has just sent to Washington. The brief letter praises Sherman’s performance at the battle of Shiloh, saying it “contributed largely to the glorious victory of the 7th.” Halleck is recommending Sherman be promoted to major general. ELSEWHERE IN THE CIVIL WAR: Skirmishes occur at Santa Fe Road, Diamond Grove, and Montevallo, all in Missouri, involving, on the Union side, mostly small cavalry detachments from Iowa, Kansas, and Missouri regiments. Nonetheless, two Union men are killed and seven wounded. From such little affairs, families suffer terrible losses while history scarcely notices. Fort Pillow is a strategically located Confederate installation on the Chickasaw Bluffs overlooking the Mississippi River, north of Memphis, Tennessee. The fall of Island No. 10 to the north has made the fort vulnerable and today Federal mortar boats pound the fort and will continue until the Confederates abandon it in June. ELSEWHERE IN THE CIVIL WAR: Under pressure from Union troops, Confederate forces are fleeing New Mexico. In Alabama, Brig. Gen. Ormsby M. Mitchel, the “astronomer-soldier” from Ohio, occupies Decatur. In the East, McClellan’s Army of the Potomac is advancing up the Virginia Peninsula, the Confederate capital of Richmond their object. Almost everywhere one looks, the Confederacy is in trouble. IT’S COMING SOONER THAN YOU THINK: April 12, 2011—less than 3 years from now!—will be the 150th anniversary of the outbreak of the Civil War. In 1861, April 12 was the day Confederates opened fire on Fort Sumter in Charleston Harbor. Having regained his self-confidence in the battle of Shiloh, Brig. Gen. William Tecumseh Sherman spends the day making mischief in the enemy’s land. Escorted by the gunboats Tyler and Lexington, Sherman, 100 horsemen of the 4th Illinois cavalry and a brigade of infantrymen use two steamboats to sail from Pittsburg Landing and up the Tennessee River, through northeastern Mississippi, and a few miles into northwest Alabama. Disembarking at Chickasaw Landing, Alabama—about 15 miles from Pittsburg Landing, the cavalry chases some Confederate pickets, who burn one of their own bridges behind them. Next, the Union cavalry destroys 500 feet of railroad trestle over Bear Creek, tears down a half-mile of telegraph wire (throwing it into the river), and wrecks some railroad track, bending rails by heating them on bonfires of railroad ties. This cuts an important line of the Memphis and Charleston Railroad, said to be the main connection between the eastern and western Confederacy. Blocked by shoals from proceeding further and doing still more damage, Sherman’s expedition returns to Pittsburg Landing and the congratulations of Maj. Gen. Henry W. Halleck, who now personally commands all troops in the area. “Halleck was delighted,” Sherman will report to Ellen. ELSEWHERE IN THE CIVIL WAR: Under pressure from Union troops, Confederate forces are fleeing New Mexico. In Alabama, Brig. Gen. Ormsby M. Mitchel, the “astronomer-soldier” from Ohio, occupies Decatur. In the East, McClellan’s Army of the Potomac is advancing up the Virginia Peninsula, the Confederate capital of Richmond the objective. Almost everywhere one looks, the Confederacy is in trouble. IT’S COMING SOONER THAN YOU THINK: April 12, 2011—3 years from now!—will be the 150th anniversary of the outbreak of the Civil War. In 1861, April 12 was the day Confederates opened fire on Fort Sumter in Charleston Harbor. It is a story that began strangely and got even stranger, turning into one of the greatest adventures of the Civil War. A few days ago, a strangely circumspect civilian named James J. Andrews came into the Alabama camps of the Union’s 9th Brigade, 3rd Division, Army of the Ohio, and called for volunteers for an undisclosed mission. Men with railroad experience were especially sought. A total of 22 men from the 2nd Ohio, 21st Ohio, and 33rd Ohio infantry regiments volunteered. 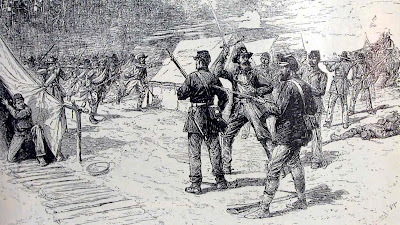 Under Andrews’ direction, they changed into civilian clothes and were told to claim they were Kentuckians going to join the Confederate army. Then they left camp, told to work their way east through Confederate territory and head for a Western & Atlantic Railroad station at Marietta, Georgia. A few of the men did not reach the Marietta railroad station, but by this morning the rest had. They bought tickets and boarded a train from Atlanta, heading north to Chattanooga. A few miles north, the train stopped at Big Shanty so everyone could get breakfast. Under the nose of unsuspecting Confederate sentinels, Andrews’ men uncouple the last few cars of the train and take command of the locomotive. With a screech, what remained of the train—a locomotive named The General, its fuel-and-water tender, and three boxcars—takes off, a daring hijacking by Yankees deep in Confederate territory. The men have courage to spare, but they need luck as well. They are not to have it on this day. 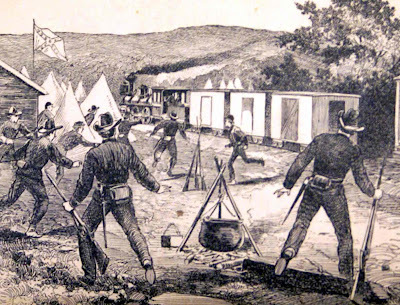 The men have been told to destroy railroad bridges behind them, which would block quick Confederate reinforcement of Chattanooga, making it vulnerable to attack by Union forces. Capturing Chattanooga would be a big step toward Lincoln’s goal of freeing eastern Tennessee, an enclave of Union sympathizers surrounded by the Confederacy. However, the hijackers’ ability to make their way north depends on dovetailing their progress with southbound trains headed south on the same track. Doing that smoothly requires that all trains be running on time. They are not. The captured train has to wait on sidings for southbound trains to pass. Otherwise, things go well at first, the hijackers cutting telegraph wires and tearing up track—but burning no bridges. Confederates are doggedly pursuing the The General, at first on a railroad handcar, switching to a locomotive, and switching again to a faster locomotive. The pursuers repair broken track and push aside debris and burning boxcars left behind by the fleeing Ohioans. Unable to outrun their pursuers and out of fuel, the Union men abandon The General near the Georgia/Tennessee border and scatter into the woods. All are captured. Eight, including Andrews, are executed as spies. Six will be exchanged for prisoners held by the Union. Eventually, 19 members of the raiding party will be awarded the newly created Congressional Medal of Honor. The very first recipient of the Medal of Honor is an Ohioan named Jacob Parrott, a member of the 33rd Ohio and the youngest hijacker. He had resisted Confederate beatings intended to make him talk. Parrott had been born near Lancaster, Ohio. After the war he moved to Kenton, where he later died and is buried in Grove Cemetery. In 1927, Buster Keaton made a comedy-drama about the Great Locomotive Chase, as the event has come to be known. In 1956, the Walt Disney organization made a movie by that name. Fess Parker played James J. Andrews. It took four days after the battle at Pittsburg Landing Tennessee, (“Shiloh”) but finally Brig. Gen. William Tecumseh Sherman, sits down to write his wife, Ellen. Emotionally fractured by the pressure of his duties only a few months before, Sherman now sounds positively jaunty. Last Sunday morning he was caught off-guard by a surprise Confederate attack that never should been a surprise, but Sherman didn't waver in his duty. Many of his men, including officers, fled in panic, but Sherman boldly galloped back and forth across the battlefield, waving his sword and rallying his remaining troops. The Confederates’ attack was overwhelming, but, under Sherman’s direction, his remaining 5th Division men fought stubbornly, giving up ground reluctantly and slowing down the Confederate advance. “Well we have had a big battle where they shot real bullets and I am safe, except for a buckshot wound in my hand and a bruised shoulder from a spent ball,” Sherman writes, adopting a slightly ironic tone. He admits he had some close calls: three horses were shot out from under him and his orderly and bodyguard, an Illinoisan named Thomas D. Holliday, was killed by his side. In fact, Sherman and Grant were becoming closely acquainted, with Sherman undoubtedly impressed by Grant’s calm resolve during the battle. Cump is feeling confident enough to accept the possibility of playing an important role in the war to come. “I have worked hard to keep down but somehow I am forced into prominence and might as well submit,” he tells Ellen, reversing his previous resolve to stay in the background and let others be the leaders. Elsewhere at Pittsburg Landing, something momentous is happening. Maj. Gen. Henry W. Halleck has arrived from his St. Louis headquarters to take over command, relegating Grant to a meaningless secondary position. Halleck has never commanded more than a platoon in the field. Soon, Pope’s Army of the Mississippi, fresh from its victory at Island No. 10, will join the forces already at Pittsburg Landing, and then, under Halleck’s direction, perhaps the slowest and most ponderous advances of any army in the Civil War will begin. ELSEWHERE IN THE CIVIL WAR: This afternoon, Fort Pulaski, a Confederate emplacement guarding the channel to Savannah, Georgia, surrenders. Union cannon on nearby Tybee Island had fired over 5,000 projectiles against the fort, blasting two holes through its brick wall. Capturing the fort expands the Union naval blockade of the Confederacy. In Alabama, Union forces under Brig. Gen. Ormsby McKnight Mitchel, an Ohio professor of science known as the “Astronomer-Soldier," occupies Huntsville, an important center for Confederate rail and river transportation. Grant’s account of the battle itself is technically correct, if brief. More than half his report is devoted instead to praising various members of his command, most of all for Brig. Gen. William Tecumseh Sherman, “a gallant and able officer [who] displayed great judgment and skill.” Grant does not say his army was surprised, nor how far back it was driven, nor how thousands of men—“skulkers”—deserted the battlefield for the shelter of the bluff by the river. And, though he gives Don Carlos Buell some words of praise, he does not--nor ever will--say Buell's Army of the Ohio made the critical difference on the second day of the battle. When, in days to come, criticism of Grant rings out in northern newspapers, Sherman will stoutly defend him. To the end of their days, Grant and Sherman will deny they were surprised at Shiloh. Others will be less generous. Within a few days, Capt. Emerson Opdycke, who served as acting major of the 41st Ohio during the second day’s battle, will write his wife a withering assessment of Grant. Opydcke’s forthrightness emulates that of his immediate commander, Col. William B. Hazen, who was never one to mince words. In his post-war memoir, Hazen was tart about whether Grant was surprised at Shiloh. Among the evidences of the surprise, according to Hazen, were that the enemy captured Union officers’ horses at the picket line and took their blankets, and that civilian sutlers’ supplies—which would have been long gone if a battle had been anticipated—remained to tempt the Confederates. IT’S COMING SOONER THAN YOU THINK: April 12, 2011—less than 3½ years from now!—will be the 150th anniversary of the outbreak of the Civil War. In 1861, April 12 was the day Confederates opened fire on Fort Sumter in Charleston Harbor. The battle had “no equal on this continent,” Grant says, and he is right. In this two-day bedlam of blood and fury, a record 3,482 men have been killed (1,754 Union, 1,1728 Confederate) and 16,420 men wounded (8,408 Union, 8,012 Confederate). The gruesome outcome shocks both Northerners and Southerners. It will remain the costliest two-day battle of the war. Northern exultation over the victory will begin to fade as newspapers begin publishing reports of Grant’s lack of preparedness. In the meantime, the weary soldiers of both armies try to pull themselves together. 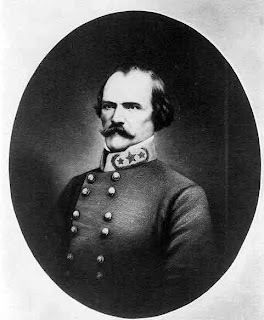 The discouraged Confederates stream back to Corinth, Beauregard harboring an unrealistic hope that Maj. Gen. Earl Van Dorn’s Army of the West, then in Arkansas, will come to his aid. Delayed by his loss to a Union force at Pea Ridge, Van Dorn and his men will not reach Corinth until April 18. Meanwhile, 130 miles north, Brig. Gen. John Pope and his recently formed Army of the Mississippi were accepting the surrender of the Confederates who had been holding Island No. 10, yet another position that had been blockading Union river traffic on the Mississippi. Over 4,500 soldiers, including their commander were captured, as were 52 big guns and other equipment the Confederate forces needed badly. In the opinion of Maj. Gen. Henry W. Halleck, Pope had conducted a brilliant campaign. In order to surround the Confederates on three sides, Pope had ordered a 12-mile canal dug around the enemy position. He then sent gunboats and troop carriers through it, and within four days Island No. 10 was surrendered. At almost exactly the same time, the North had won two smashing victories—Shiloh and Island No. 10. Only a year after secession and the attack on Fort Sumter, the western Confederacy was coming apart. Surely, Northerners thought, the end is near. About 25 to 30% of the units in Grant’s and Buell’s armies (combined) were from Ohio. Perhaps 10% of Pope’s army was. Last Saturday—one day before the Johnston and Beauregard’s Confederates attacked Grant at Pittsburg Landing—Brig Gen. Don Carlos Buell ’s Army of the Ohio arrived at Savannah, which is on the opposite bank, about seven miles downriver, from the battlefield. The weary soldiers, who had marched all the way from Nashville, set up camp and spend the night in peaceful slumber. Yesterday morning, however, early risers greeting the spring sunshine could hear what one called “a dull, distant sound like the heavy breathing of some great animal below the horizon.” Soon, bugle calls were calling the men to arms. Ordered by Buell, an advance brigade of three regiments, commanded by Col. Jacob Ammen, an Ohioan, made a forced march, arriving at the riverbank opposite Pittsburg Landing at dusk. They were quickly ferried over and fed into Grant’s defensive line. Throughout the night, packed steamers shuttle most of the rest of Buell’s men from Savannah to Pittsburg Landing. In addition to Buell’s men, Brig. Gen. Lew Wallace’s division of Grant’s army shows up in this morning, delayed in its march from Crumps Landing by confusion over orders. The new arrivals tramp past thousands of skulkers, huddled under a river bluff, who taunt them with warnings of disaster. All night long, two Union gunboats keep up a bombardment of Confederate positions. Union field hospitals wor through the night, amputated limbs piling up nearby. Seeking shelter from the rain, Maj. Gen. Ulysses S. Grant goes into one of the surgical tents, but soon leaves, unable to bear the sights and sounds. He spent the rest of the night under a tree. In the morning, Grant’s reinforced army begins moving across the battlefield. It is a sea of mud, with dead men and horses everywhere, scattered debris—hats, rifles, blankets, knapsacks. Trees have been riddled and shattered by gunfire. Soon, the Union are attacking, and this time it is the Confederates’ turn to be surprised. Among the 17,000 men who had marched all the way from Nashville are 5,000 to 6,000 Ohioans, the most from any state in Buell’s army. Lew Wallace’s division adds another 7,500 men to the Federals, and now Grant has 25,000 fresh soldiers, as well as his veterans of yesterday. The Confederates have no reserves to draw upon, having used them yesterday. Although the Southerners fight bravely, they are driven back and by 2:30 in the afternoon Beauregard is ready to order a retreat. The battered army of Mississippi begins making its way back to Corinth, the promise of early victory shattered. The Confederates have suffered 24% casualties—killed, wounded or captured—and the Union 22%.With a total of nearly 24,000 men lost, it is the costliest two-day battle of the war. It shocks Northerners and Southerners alike. Grant gives up all hope of ending the war quickly. It will turn out to be one of the most fortunate decisions of the war. Early this morning, 1st Lt. Marion Posegate of the 48th Ohio is enjoying his first cup of coffee and “the soft, shimmering opening of a typical Southern spring day” when suddenly he hears the rolling thunder of a drummer’s alarm and scattered gunshots. Posegate—who is acting adjutant of the 48th—buckles on his sword, but before he can finish ordering the regiment into a defensive line of battle, the impetuous colonel of the 48th, a Cincinnati lawyer named Peter J. Sullivan, rushes up and orders the men forward, towards the sound of gunshots. But the men soon encounter an oncoming rush of Confederates and rush back to their original position. They fire one unified volley standing up and then wisely take cover behind trees and fallen trunks, firing carefully and at will. The 48th Ohio is one of Sherman’s regiments, camped along and a ridge, with the crude log hut known as the Shiloh Meetinghouse its centerpiece. From his place on the ridge, 1st Lt. Ephraim C. Dawes of the 53rd Ohio views a scene that is “one never to be forgotten.” Sherman’s division is forming a ragged line of battle, but it has gaps in it because so many men are absent because of sickness. Behind the line of battle, teamsters, servants, and frightened soldiers are fleeing in the direction of the Tennessee River. Directly in front of Dawes are solid ranks of Confederates, their bayonets and swords gleaming in the early morning sun. They are advancing four ranks deep on a three-mile front, with one rank after another rolling forward like the tide. Some Union regiments break and run for the shelter of a bluff by the river; others, though depleted by runaways, stand their ground until they can resist no longer and are forced to retreat, still fighting. This goes on all day, thousands of men running away, but more thousands putting up a stout defense even as they backpedal. Galloping furiously back and forth, directing the troops, are Maj. Gen. Ulysses S. Grant and Brig. Gen. William Tecumseh Sherman. They had failed to prepare for or even consider the possibility of the Confederate attack, but now they are working fearlessly and furiously to rally their stunned forces. Enemy fire is so heavy, according to Posegate, that thickets of brush look as if they have been cut down with “a dull sickle.” Trees are riddled with bullets and branches broken; only the fact that the inexperienced Confederates fire too high—as new soldiers often do—saves the 48th from annihilation. Posegate is wounded and removed a hospital boat. By evening, the Union forces are pushed back almost to the Tennessee River, but they still hold Pittsburg Landing. Artillery and a deep ravine protect Grant’s army from destruction and so—unintentionally—does Confederate Gen. P.G.T. Beauregard, who took command after Maj. Gen. Albert Sidney Johnston was mortally wounded. Certain he can finish off the Federals tomorrow, Beauregard calls off the attack at 6 p.m, wires Richmond that he has attained “a complete victory,” and goes to sleep in Sherman’s abandoned tent. That calm optimism in the face of discouragement will become Grant’s hallmark and, in Sherman’s opinion, the explanation for his greatness. Johnston’s second-in-command, Maj. Gen. P.G.T. Beauregard, is in despair. “The Little Creole,” as the fiery officer is nicknamed, is not one to shrink from fighting, but he fears the element of surprise has been lost. The inexperienced Confederate soldiers have taken two days longer than expected to make the march and they made it noisily, carelessly yelling and firing off their guns to try them out. Soldiers on the outer edges of each army have clashed several times, both sides taking small numbers of casualties. Surely, Grant must be ready and waiting for Johnston. So nervous in Kentucky (and, later, Missouri) about the possibility of enemy attack, Sherman now has completely reversed himself, refusing to acknowledge whatsoever any sign of danger. Sherman’s opinion counts, because his division, now counting about 8,500 men “present for duty,” occupies the Union encampment’s most forward position, about two miles inland from the Tennessee River. Four other divisions are scattered about the rolling plateau and a fifth, Lew Wallace’s, is stationed several miles away. Because Grant’s mind is fixed on making his own attack on the Confederates, who ordinarily would be expected to remain in Corinth, protected by their earthworks, Grant has ordered no earthworks of his own. His 41,000 troops at Pittsburg Landing are scattered about, arranged more for convenience than defense. At almost the same time as Grant is reassuring Halleck, the Confederate generals are gathered around a fire only a few miles from Pittsburg Landing. They are pondering their options. Beauregard argues for cancelling the attack and returning to Corinth, fearing a “victory turned into defeat” by an alert Union army. But Johnston—who is suffering public scorn for withdrawing from Nashville—apparently feels he cannot afford another seeming sign of weakness. The attack will go forward in the morning. Their horses will drink from the Tennessee River. The 45,000 Confederates advancing towards Grant were supposed to arrive today at an intersection about four miles from the Union encampment. Thanks to muddy roads, the inexperience of the troops, and Beauregard’s poorly organized line of march, few do. Even the Confederate commander. Maj. Gen. Albert Sidney Johnston, gets a late start. He doesn’t leave his headquarters in Corinth until this morning, By afternoon he has reached a tiny cluster of log cabins called Monterey He commandeers one of the cabins for his headquarters. Monterey is less than half way to the expected battleground at Pittsburg Landing. Because of the unexpectedly slow advance, Johnston postpones the attack on Grant until tomorrow. Meanwhile, the Union camp is seeing signs that something is up, but comprehension where it counts—at top command level—is lacking. There is a small skirmish between Confederate cavalry scouts and a few Union pickets, resulting in one wounded Union soldier. Somebody in the 77th Ohio notices small animals scurrying out nearby woods and so three men of the 77th stroll out to see what the cause might be. They see a swarm of Confederates in the distance—apparently an advance guard—and send a message to their division commander, Brig. Gen. William Tecumseh Sherman. In the afternoon, Col. Ralph Buckland orders his brigade—consisting of the 48th Ohio, 70th Ohio, and 72nd Ohio—out of camp for drill. They are expecting to find eight Union picket guards on the camp’s outskirts—but they have vanished, perhaps captured. Buckland’s men go looking for the missing men and get in to a fight with some Confederates. Sent to Buckland’s aid, Maj. Elbridge G. Ricker of the 5th Ohio Cavalry captures nine prisoners and sees a large enemy force in the distance, including cavalry and artillery. Ricker estimates the enemy force at 2,000 men. Shiloh—the word is often taken to mean “peace” or “giver of peace”—is a lovely place in the spring. Early this morning, the 45,000-man Confederate Army of Mississippi begins moving, as ordered yesterday by its commander, Maj. Gen. Albert Sidney Johnston. The Confederates are supposed to approach Maj. Gen. Ulysses S. Grant’s Union forces camped at Pittsburg Landing, 22 miles away, and get in position to attack the next day. With drums beating and trumpets sounding, the Confederates were roused from their camps at 4 a.m., but confusion and inexperience keeps pushing the departure time back from 6 a.m. It is mid-afternoon before the gray columns began moving out of Corinth, Mississippi. Once moving, there are still more delays. General Johnston had allowed his second-in-command, Gen. P.G.T. Beauregard, to organize the line of march. Beauregard put together a plan that is so complicated that the inexperienced soldiers keep getting mixed up or held back as columns run into each other. Hooting and firing off guns, the green Confederate soldiers make enough racket to wake the dead—but not the Federals, most of whom remain blissfully unaware of the looming danger. It’s not the fault of the ordinary soldiers, some of whom are sensing trouble, but of their top commanders, most of all, Brig. Gen. William Tecumseh Sherman and Grant. It begins to rain. Tired and frustrated, scarcely half-way to their destination, the Confederates halt for the night and try to make themselves comfortable. General Beauregard begins to worry that the element of surprise has been lost. In one of the most stunningly bad examples of military preparedness in the war, there seems to be almost nothing the Confederates can do to alert Grant’s army. There is a battle coming, and there will be grave failures on both sides. However, one side’s will make more difference than the other’s. ELSEWHERE IN THE CIVIL WAR: President Lincoln has discovered that McClellan, now on his Peninsula Campaign, had left fewer troops to defend Washington than he had promised. The President tells Secretary of War Edwin M. Stanton to hold back one of the army corps that had been originally intended for McClellan. Lincoln also directs that General McClellan to “commence his forward movement from his new base at once.” Lincoln keeps getting hard lessons in McClellan’s insistence in conducting warfare more as he pleases than as he is directed.